The radial dose function g(r) is based on measurements in infinite homogeneous water, ie with full scatter geometry. When sources are placed in a plaque with a high-Z backing material such as gold, lead or silver, these conditions no longer apply. Scatter originating behind the plaque is reduced and L-shell flouresence from the gold is added. The measured scatter modifier function B(r) attempts to correct for deviations from the homogeneous full scatter geometry assumed by TG43 and includes several combined effects, including a small, short range (< 3 mm) increase in dose due to absorption of the very low energy flourescence from the gold, and a longer range (> 3mm) reduction in dose due to loss of backscatter from water "behind" the gold shell that is never exposed to primary radiation due to collimation by the shell. 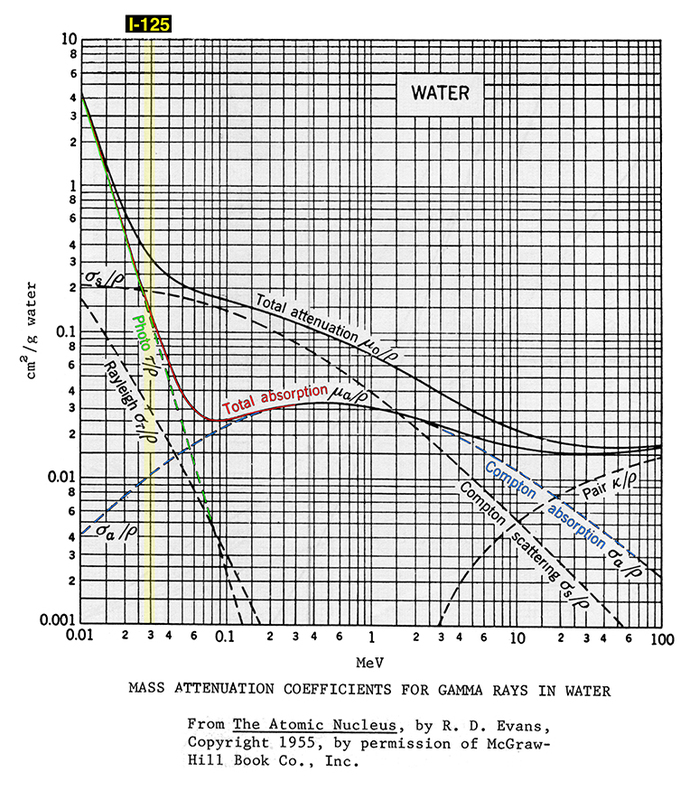 At I-125 photon energies, absorbed dose is strongly dominated by photoelectric absorption and so there is not much Compton backscatter to begin with, even in a homogenous infinite water environment. Nevertheless, measurements with TLDs indicated that a small correction is required. Important: Scatter and flourescence correction are already included in the carrier correction factor T(r,u) for COMS plaques which use a silicone carrier because the flourescence is absorbed in the silicone. The scatter modifier B(r) should be disabled for a COMS plaque that uses a silicone carrier, but enabled for a COMS plaque that uses a gold insert instead of the silicone. 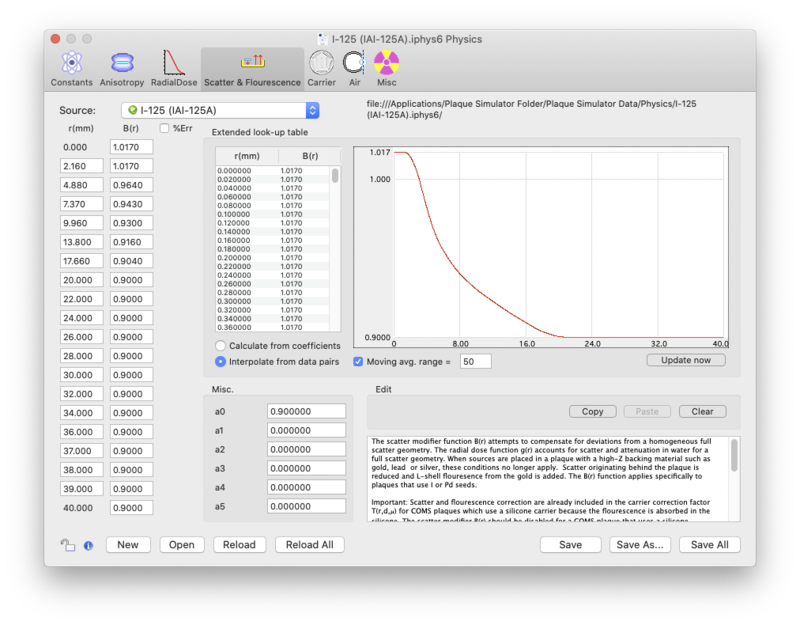 The B(r) function applies specifically to plaques that use I or Pd seeds, not Ir. For the BEBIG Ru106-Rh106 plaques this parameter is used instead to store additional anisotropy kernel data for the convex direction from a point source. 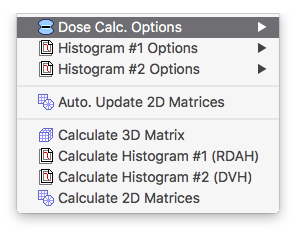 To expedite the dose calculation, Plaque Simulator uses a 2001 element extended B(r) lookup table covering the range 0..40 mm at increments of 0.02 mm. The B(r) lookup tables are interpolated from a table of 20 data pairs describing the function in the range 0..40 mm. The data that has been installed in Plaque Simulator's resources is from our published measurements. For r > 40 mm, B(r) = coefficient a0. When the Gold Backing B(r) item is checked in the Dose Calc. 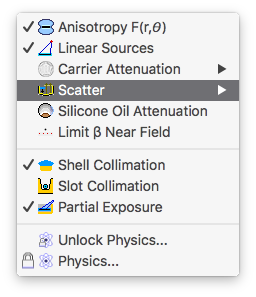 Options -> Scatter menu, or the Gold button in the Prescription window is enabled, the scatter modifier B(r) is included in the dose calculation.